Simply spray very fine coats of the colour onto the item after masking off areas you don’t want re-colouring. 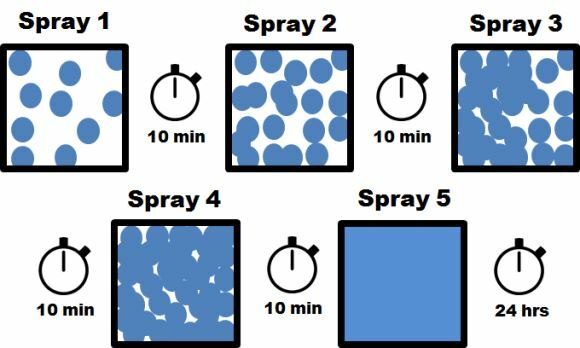 The coats should be so fine that your first coat only produces speckles, continue building up the speckles to completely cover the area with colour, this usually takes 3-5 separate sprays with around 10 minutes dyring time between sprays. It is recommended that you always spot test an inconspicuous area of each material first, allow that to dry completely to a final finish. You may use acetone (Acrylic Nail Polish Remover), available from Superdrug or similar if the item is very soiled; be careful that the acetone doesn't damage your item though, so spot test this. For vinyl items, acetone is can be too harsh, use our TRG Universal Cleaner. For leather items, acetone is usually too harsh, use our TRG Universal Cleaner. For plastic items, you may need to gently sand the surface. Many plastics have a 'sheen' or 'layer' on the top, this is actually part of the moulding process and helps the item to be removed from its mould, this needs removing as the dye can not penetrate it. Do not use white spirit it will leave a residue and prevent the dye from bonding with the item. Do not use decorators soap crystals. Shake the can. Then Shake the can some more. If your arm isn't aching, you've not shaken it enough. Well maybe. Shake the can for at least 10 minutes the first time you use it. Continue mixing the paint in the can between sprays occasionally by swirling the bottom of the can, keeping the top as stationary as possible. Yes really, it is that important you shake the can to really mix up all the chemicals. So even between layers (see image below) you must swirl the can. Why swirl and not shake? If you get some of the dye on the ridge of the can, you don't want it flying off onto your item and leaving it with drips. Number one tip: Shake the can MORE than you think is necessary at first before using the can. Number two tip: Spray only VERY FINE layers, to build up a single coat. This allows the dye maximum opportunity to penetrate the material, rather than sitting on top of itself. Apply around 4-6 layers of spray. That is, the first spray is only like putting spots on a Leopard, allow to fully dry, this could take up to 20 mins but if outside usually 10. Then the 2nd spray is adding more spots, but you can still see the original material, until you get to the 4th or 5th layer, where you won't be able to see the original material. Number three tip: Do not spray in extreme temperatures. That is you should ideally be applying your spray at room temperature or there about (15 - 24 degree Celsius). It has been known for high temperatures to affect the dyes, do not use at over 26 degrees Celsius, if you do, as always, spot test. Final tip: Spot test. Ensure you are completely happy with the finish prior to undergoing a complete job or project. It is extremely rare that the dyes don't work, less than a half of one percent of our customers report back the dye didn't work for them, but if they miss this tip, they can remove the dye (because the dye didn't bond, hence not working), but it takes longer than it would have to remove a spot test. Choose the finish you'd like to keep. From High Gloss to a deep Matt. Usually the Vinyl Dyes dry to a satin finish, sometimes closer to Matt, sometimes closer to Gloss. This does depend on the item and the colour chosen and how you perceive it. Finishing is simple, just a single layer of spray is usually enough, use two or more if you know it's under high wear. We have tested both of our recommended finishers. You can spray our Vinyl Dye sprays over the Gloss and the Matt sprays again. So if you change your mind about colour, that's still an option even when a finishing spray has been used. Want a Matt Finish? Use our Matt Clear Varnish 'Topper', we've tested it and it's fantastic, but like always, please spot test. Want a Gloss Finish? Use our High Gloss Varnish 'Topper', we've tested it and it's fantastic, but like always, please spot test. Wanted Satin? Most items dry to a satin naturally, so no need for a topper. Before completing a project, you should patch test as small area, and wait at least 24 hours until you are completely happy with the finish.If you're not happy with the finish/colour or whatever for any reason after the patch test, it's unlikely that completing the whole project is going to change your opinion. Our money back guarantee only counts for 1 of each type of product, e.g. 1 vinyl dye can.